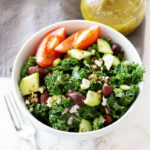 This Greek Kale and Quinoa Salad is a powerhouse salad full of nutrition and fiber! Perfect for any lunch or dinner! Add chicken and you have yourself a meal packed full of protein! This Greek Salad is addictively delicious! Super healthy and quick to make! I remember when I was a little girl and my parents would take me and my sister out to dinner, restaurants would always garnish the side of our entree plates with kale. My parents would say, “No! Don’t eat that! It is only for decoration!” So I never ate the kale. I thought it was fake…a garnish on my plate. Never would I have fathomed that I would grow up and want to eat that fabulous little kale garnish. Much less write a recipe using kale! But here I am…writing about that garnish I was told never to eat. Do you guys remember Paradise Bakery? Panera Bread recently acquired them, but right before they closed their doors, I walked in for lunch one day and ordered a Kale and Quinoa salad. It was FANTASTIC! After I finished my salad, I immediately came home and started figuring out the ingredients and flavors so I could make this salad at home. Mr Mason was like…”Didn’t you go out to lunch? Are you still hungry?” Ha Ha!! Nope – I just really wanted to recreate this Kale and Quinoa salad! And I nailed it on the 3rd try. Oh…and it’s good ya’ll. Mouthwatering delish! So I’ve labeled this my “Paradise Bakery Copycat Greek Kale and Quinoa Salad”. And now I’m going to share it with you! Before we get to the recipe, let’s talk about some of the ingredients in this salad and their nutritional value. Because it’s important and I like being all healthy! Let’s start with Kale. Kale has the reputation of being one of the worlds “healthiest foods”. Kale is a part of the cruciferous vegetable family and its FULL of vitamins A, C and K. It also contains minerals such as copper, potassium, iron, manganese and phosphorus. 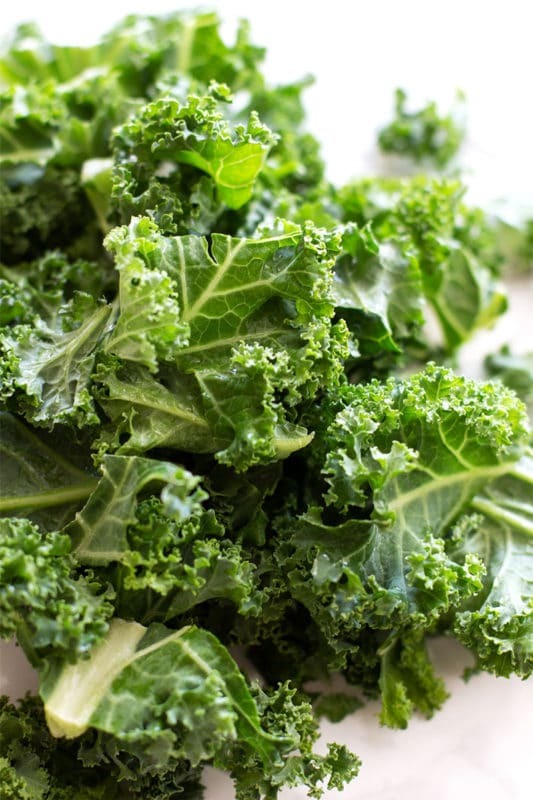 And my favorite…1 cup of raw kale has 3 grams of protein! It’s also very high in iron. Oh…and fiber!! There is 2.6 grams of fiber in 1 cup of kale. POWERHOUSE food and heart healthy! Quinoa, also known as “the mother of all grains” is another key ingredient in this salad. But if you do your research…its not really a grain at all. It’s a relative of spinach, beets and chard. Quinoa is naturally Gluten Free and is considered a complete protein. 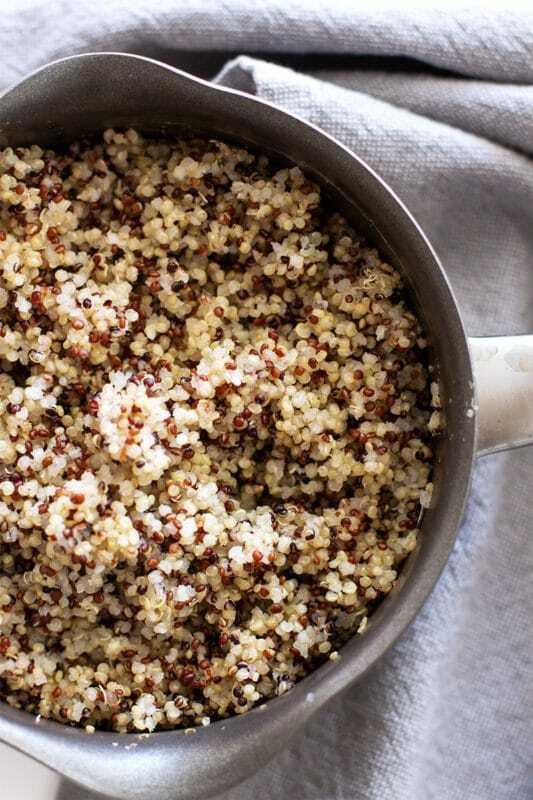 1 cup of cooked quinoa contains 8 grams of protein. Quinoa is also considered one of the worlds “healthiest foods”. It’s full of fiber, iron, copper, and vitamin B6. It’s also a great source of magnesium, phosphorus and manganese. I like to buy the tri-color bag of mixed red, black and white quinoa. Why? Because of the texture and flavor difference. And before you ask, yep…I do have that palate that can tell the difference in in taste and texture. 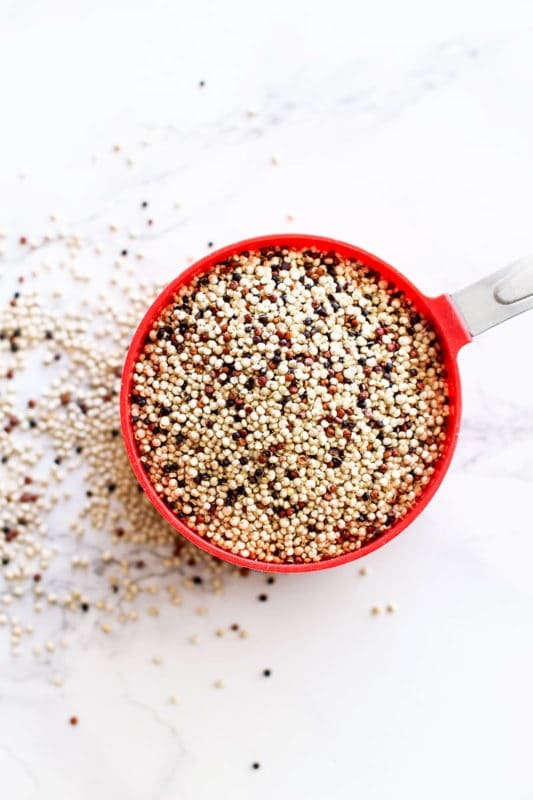 If you want to know more about the different types of quinoa, check out this article here: What’s the Difference between White, Black, and Red Quinoa? (and other colors too) So informational! You’re going to need 2 separate ingredient lists for this recipe. First, make the quinoa. I follow the instructions on the back of the quinoa package. 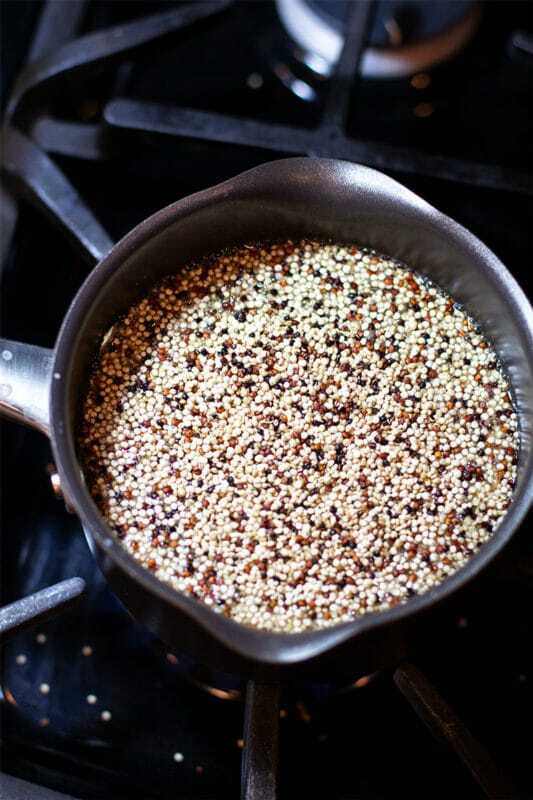 Super simple ya’ll…I always cook 1/2 cup raw quinoa to 1 cup water. I mix the quinoa and water in a small pot until it comes to a rolling boil. Then I cover and reduce the heat to low. It only takes about about 15 to 20 minutes to cook. Once the quinoa is done, fluff it with a fork and set aside. Next, let’s make the dressing. 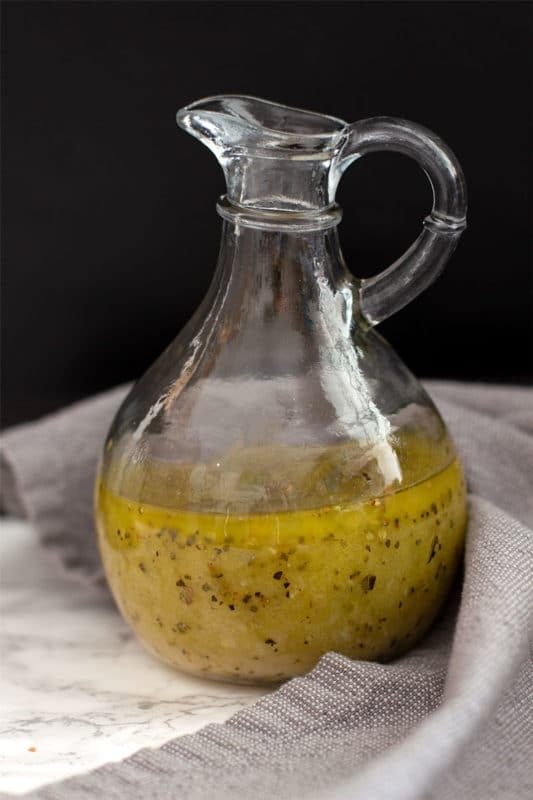 Oh how I LOVE this Greek dressing! 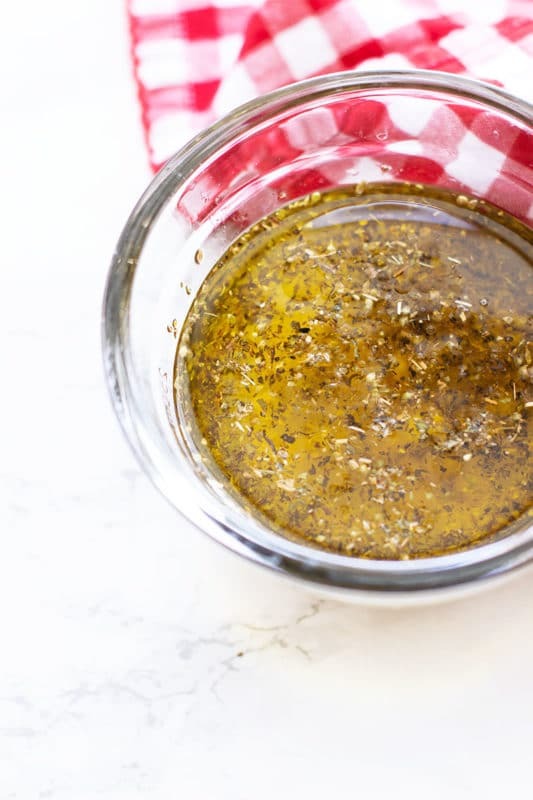 It’s zesty and full of Greek flavors like oregano, olive oil, lemon and garlic! So delish and so incredibly easy to make! 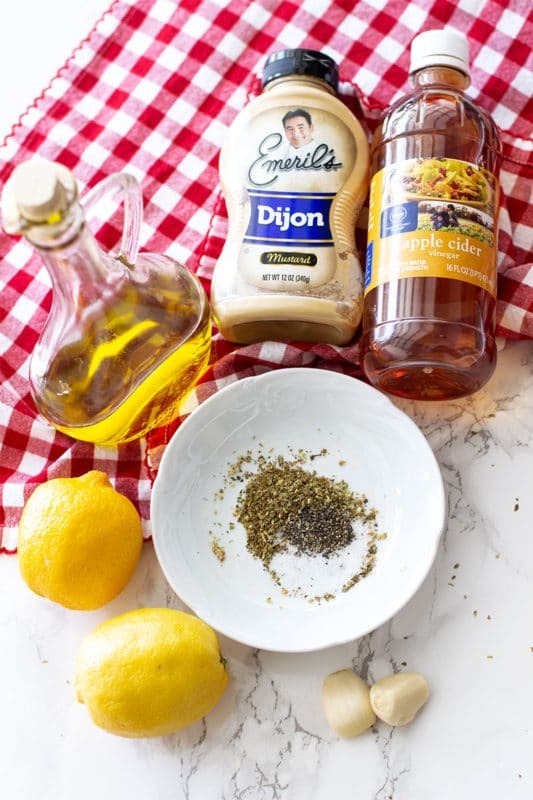 Grab all the salad dressing ingredients and place them in a small mixing bowl that has a lid. Shake the mixture together vigorously. Pour the Greek dressing into a salad dressing container and set aside. Now for the Kale and Quinoa Salad. Chop the cucumbers and red onions. Evenly distribute the kale into four bowls and add the cucumber, red onions and Kalamata Olive to each bowl. Add 1/4 cup of cooked quinoa to the salad and then sprinkle with crumbled feta cheese. Want to add some protein? 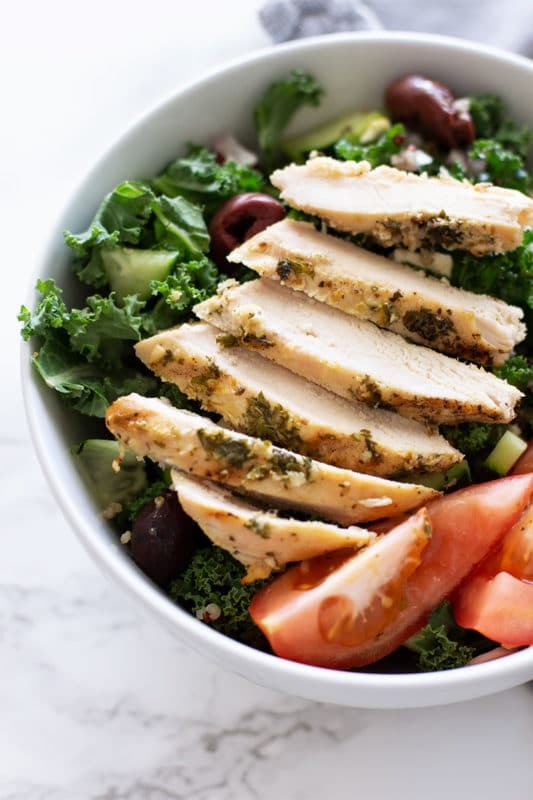 I always add chicken to my Greek Kale and Quinoa Salad! Not just any chicken though…I always grill several breasts of my Greek Marinated Chicken recipe and add on top of this salad. It’s a perfect pair! Top this salad off by pouring on the Greek dressing! Grab a fork and dive in! If you’re going to make the Greek Marinated Chicken, make sure you let the chicken marinate for at least 24 hours. And grill the chicken for the best results. The salad lasts for about 3-4 days and is perfect for lunch, dinner or even a snack! I love pairing this salad with my Homemade Vegetable Soup or my Kale and Leek Soup. The tomato is optional…and I don’t love raw tomatoes but let me tell you…the tomato helps POP the Greek flavors! I have the pallet to differentiate these flavors! So yum! Ya’ll…I’m telling you. I’m in love with this salad and it’s now my new favorite. I took some to my parent’s house tonight and my mom was like, “Oh my goodness…this is fantastic!” I love sharing food that not only tastes great, but is also really great for you! Again…Recipes Worth Repeating! That’s what I’m about! My little 6 year old liked this salad and ate an entire bowl! And yep…this recipe is naturally Gluten Free! Enjoy this power packed salad! So tell me…did you make this recipe? If so, give my Greek Kale and Quinoa Salad a star rating below! Oh…and make sure to FOLLOW ME on Facebook, Twitter, Instagram and Pinterest because ya’ll… I’m CONSTANTLY posting yummy food that I know you will love! Don’t miss out on the yumminess! This Greek Kale and Quinoa Salad is a powerhouse salad full of nutrition and fiber! The perfect for any lunch or dinner! Add chicken and you have yourself a meal packed full of protein! This Greek salad is addictively delicious! Cook quinoa according to package instructions. I always cook 1/2 cup raw quinoa to 1 cup water. I mix the quinoa and water in a small pot until it comes to a rolling boil. Cover a reduce heat to low. Cook for about 15 to 20 minutes. Set aside when done. While the quinoa is cooking, chop the kale into bite size pieces and rinse well. 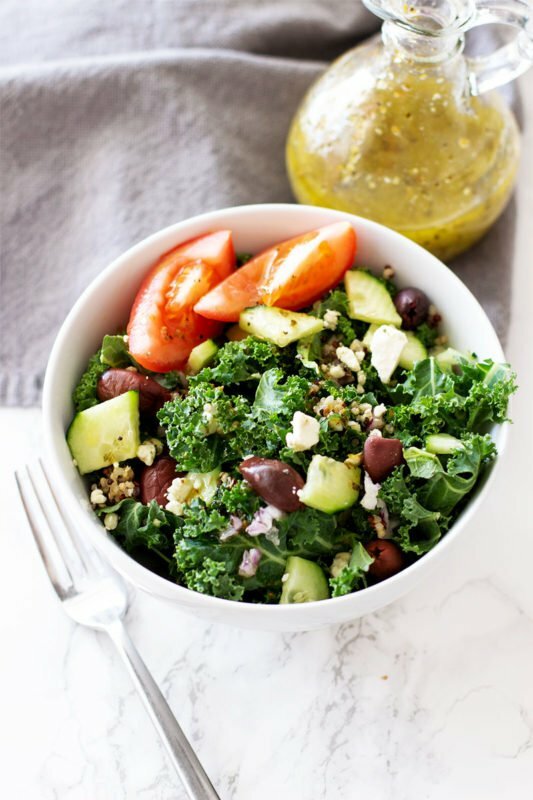 In a large bowl, add the kale, cooked quinoa, Kalamata olives, red onion, diced tomatoes, cucumber and feta cheese. Add Greek dressing to the salad and mix well. Add just enough of the Greek dressing for your taste preference. Store leftover dressing on counter. Update Notes: This post was originally published on August2015, but was republished with an updated step-by-step instructions, pictures and tips in May of 2018. Quinoa is so great! If you want to do a meatless meal it’s a great way of getting all the protein you need! This salad looks amazing and I can’t wait to try the recipe! Yes – exactly!! Enjoy the nutrition and the taste of quinoa! Totally my kind of meal! A great nutritious salad for a quick lunch is always a winner! How hilarious that your parents used to tell you not to eat the kale! My how times have changed, haha! This salad looks delicious – perfect for eating all the leafy greens! Thank you! Hope you enjoy! !